John: Welcome to the CharacterStrong podcast where we have conversations on school culture and leadership. Today we're talking about Danny Steele. 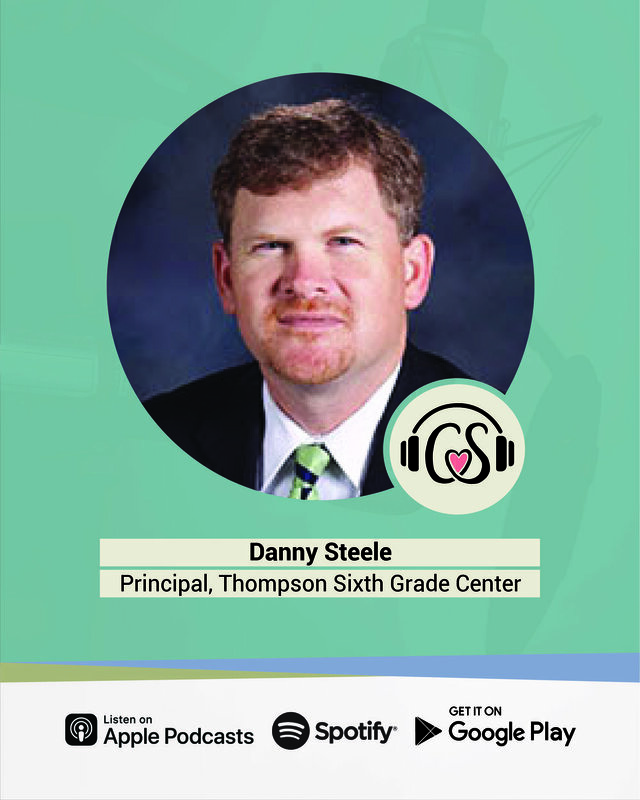 Danny's in his 26th year of education and this school year marks his fifth year as principal of Thompson Sixth Grade Center in the Alabaster City School System just south of Birmingham, Alabama. Prior to this position, he served as a high school principal, an assistant principal, and as a teacher and coach. He has written two books with Todd Whitaker, which were released in February of 2019, Essential Truths for Teachers and Essential Truths for Principals. In the fall, Steele began teaching full-time at the University of Montevallo in the Department of Instructional Leadership. He resides with his wife and three children in Birmingham, Alabama. Are you ready? Let's get CharacterStrong with Danny Steele. John: All right, it is so wonderful to have Danny Steele on today's CharacterStrong podcast. Danny, I've been looking forward to this moment for quite some time, my friend. Danny: John, I appreciate you having me on. It's a privilege to be able to talk with you guys and I certainly appreciate the platform that you give educators to share around the country. John: Well, thank you. Well, yeah, I was trying to find the right time to reach out to you because I know that you're really busy. And I saw that recently you released two books with Todd Whitaker and so I'm like, "This would be a perfect opportunity." We ordered them immediately and went through them immediately. And was excited that we could even use this as an opportunity. But tell me a little bit about the two books that you recently released with Todd. Danny: Yeah, I'm very excited about the release. Todd Whitaker was a role model of mine and sort of a hero of mine before we even met. And so we initially got connected on Twitter and then met up at a conference and began collaborating on this idea. And we both shared some common values about what drives educators, and what schools should look like, and how leaders are more effective leading a school. And so this was an opportunity to try to articulate and put on paper some of the values that we feel were essential and hopefully they're gonna resonate with other educators. John: I love it. Yeah, I mean, one of the things that when we first came across your work was Steele thoughts. And I mean, if anybody is not following you yet on Twitter, they need to. And tell us what your Twitter handle is. Because it's like daily inspiration. Danny: Just at Steele Thoughts. John: Yeah. And I mean, the thing I think that stands out being a former teacher at the high school level and administrator at the district level is your consistent focus on being a champion for your teachers. And we know that the work of anybody in education, whether it be a teacher, whether it be a parent, educator, whether it be an administrator, that it's tough work. And sometimes you had to be incredibly intentional to stay in that positive realm. And you do that so well and are a champion for a teacher. So just first, can you talk to me a little bit about how do you do that? For you, how do you stay in the positive knowing that the work is hard? To be a champion for your staff and your students? Danny: Well, I learned early on as an administrator that administrators are defined by their ability to support teachers. And that doesn't always come natural to administrators because most educators got into the business for kids. And so trying to bond with your teachers and supporting them, that's not always a natural thing, but I learned over the years that the teachers are the ones that make the magic happen in the school building. And they have a heart for kids. And so anything I can do to support them, and to value them, and appreciate them, they're the ones that really do the hard work in the building. And I'm blessed to have great teachers that I work with. So they're easy to support and they have a heart for kids, just like I do. So when you have administrators and teachers that share the same value and the same heart for making a difference for kids, there could be some good synergy there. John: I love it. Yeah. In the book, the first one I want to talk about today was the Essential Truths for Teachers. And I know that you've been a teacher and then you've served teachers for many years at different levels. And in chapter 28 it said ... The title of it is there are 101 ways to connect with your students, but none of them work if you don't begin with care. And if you have that, you can make almost any strategy work. Talk to me just a little bit about that. Because I think some of these can come across very simple, but they're not easy. If they were, everybody would do it. And it's almost like that idea of that care part. That's the plate. We need to strengthen that plate if anything else is gonna happen. Talk to me a little bit about that. Danny: Well, there's certainly not a formula for connecting with kids or for winning them over. But I think if there was a silver bullet, it would be authenticity that kids can tell when you're genuine. And for the most part, kids can tell the teachers that really care about them. And teachers don't have to be perfect. But if you are genuinely concerned about the students under your care, and that will become evident to them, and I mean, it's important though to also be transparent with your values. I mean, you can't just tell the kids you care about them, you gotta show it. And if you love the students, and you care about them, and you go to bat for them, you listen to them, over time, that relationship is built and it turns out that when you build that relationship, though actually as a rule of thumb, be a lot more open to what you're trying to teach them in terms of content. But it's just about getting on their level, and respecting them, and valuing them, and liking them. You gotta like them for sure. And the ones that are the most challenging, those are the ones you gotta like the most. John: Absolutely. That's where the work needs to be done and that that is not always a very easy thing, but it's something that takes time, and that consistency with that authenticity. Love it. It's so true. And I think about then, the work. In our podcast, we usually try to stay in kind of a focused, aprroximately 10 minutes. Get right to the heart of the matter. And one of the things that stands out to me a lot of times is we also need each other in this work, in education. Like teachers need other teachers and staff members need other staff members. And a line that stood out to me recently that was really powerful from an educator was it's not that the work is any easier. It's as hard as it's ever been. But for whatever reason, this year it didn't feel like work. And when we asked them more about that, they said it was not just their focus relationally from staff to students, but also relationally from staff to staff. They said, "I actually look forward to coming to work every single day." John: In your experience as both a teacher, now as a principal, how do you see that? I mean, when you see adults really being intentional with each other, how does that play out then for kids and what role? The importance of that role, how do you see that as a building principle? Danny: I think we all face adversity. And so a commitment to bringing positive energy into the building, I think, is crucial. And so when we encounter challenges, if we look for solutions but we don't lose sight of our core purpose, and that's being there for kids, we realized ... As an administrator, my goal is to try to cultivate a school culture where teachers value each other, where they can lean on each other, and learn from each other. There is a lot of value to workshops and conferences, but sometimes the best professional development is just hanging out with your colleague down the hall. Danny: So whether that's at lunch, or a PLC on a playing period, or just connecting in between classes in the hallway, it just injects positive energy into the building. It makes the teachers stronger. And it's a great example for kids in terms of collaboration and cooperation. And when it comes down to it, kids can tell when ... Students can tell when the adults are happy to be there. And I've learned that, at least in my experience, the most significant factor as it relates to faculty morale has to do with the adults that you're working with, whether it's administration or colleagues. So the extent to which we can foster collaboration and good will, always giving each other the benefit of the doubt, I think that just goes toward creating a healthy and a positive school culture where the adults enjoy working and the kids enjoy learning. John: Love it. Well, here's what I'd love. If you'd be willing, Dan, I'd love to have you on for a second podcast here in a little series talking bat two books that recently came out, and the truths, and the inspirations that are included. And one is the Essential Truths for Teachers. And the other is Essential Truths for Principals. One, would you be willing to come back and talk one more time with me? Danny: Oh, absolutely. I'd love it. Thanks. John: Awesome. And then the second one is where can we find these books because everybody needs to get them. Danny: Oh, Amazon. You can just Google Amazon. John: Perfect. That's how I think I got mine and literally one day it was in my doorstep. And then the other day it was already finished. Thank you so much for all that you're doing. Look forward to talking to you about some practical strategies coming from these books in the next CharacterStrong podcast. Thanks for being with us today, Danny. Danny: Yeah, it's my honor to be with you. Thanks, John.